A group of over 40 NGOs have signed on to an open letter calling on senators to support SJRes54, a joint resolution introduced last month by Senators Bernie Sanders (I-VT), Mike Lee (R-UT), and Chris Murphy (D-CT). The resolution calls for a vote to authorize the U.S. military role in Yemen’s civil war under the 1973 War Powers Act. If that vote is held it could signal an end to U.S. involvement in Yemen and a reassertion of a congressional role in authorizing military action all over the world. Yemen has been mired in a civil war since September 2014, when the Houthis, a Shia group based in northern Yemen, seized control of the country’s capital city, Sanaa. The Houthis’ move came amid a dispute with Yemen’s internationally recognized president, Abd Rabbuh Mansur Hadi, who eventually fled the capital for the southern Yemeni port city of Aden. Meanwhile, the Houthis, along with forces loyal to Yemen’s former president, Ali Abdullah Saleh (who fell out with the Houthis and was killed by them in December), pushed south until they reached Aden in March 2015. At that point a coalition led by Saudi Arabia—and including the United Arab Emirates along with several other Middle Eastern and African countries—intervened in the war on behalf of Hadi and his government. What followed has been a nearly three-year-long humanitarian catastrophe, one that the United Nations says could be the worst the world has seen in the past 50 years. More than 10,000 civilians have been killed—most of those by coalition airstrikes—and millions have been displaced by the violence. An estimated eight million people are at critical risk of starvation, and the conflict has caused the worst cholera outbreak in recorded history, with over one million cases. Both of those crises have been exacerbated by the coalition’s blockade of Yemen—which is ostensibly meant to keep weapons from reaching the Houthis but has slowed and frequently prevented the entry of humanitarian aid—and by airstrikes that have damaged Yemen’s largest port, Hudaydah. The AP uncovered evidence that the UAE has been operating a network of secret prisons in southern Yemen where detainees are routinely tortured. The Saudi-led coalition’s war in Yemen would likely be unsustainable without U.S. support. The U.S. refuels and helps maintain the coalition’s aircraft. It shares targeting information with the coalition. Its naval vessels have helped to bolster the coalition blockade. And despite its occasional criticisms of the coalition’s excesses the U.S. continues to sell hundreds of millions of dollars in weaponry to Saudi Arabia and the UAE while their war in Yemen rages. All this is happening while the U.S. is conducting a parallel war in Yemen against al-Qaeda in the Arabian Peninsula (AQAP)—a group that, ironically, has benefitted considerably from the chaos created by the U.S.-backed, Saudi-led intervention. That campaign against AQAP is not covered by the Sanders-Lee-Murphy resolution. We, the undersigned organizations, strongly urge you to support S.J.Res. 54, introduced by Senators Lee (R-UT) and Sanders (I-VT), along with Senator Chris Murphy (D-CT). This important legislation invokes section 5(c) of the War Powers Resolution of 1973 to require a debate and vote on ending unauthorized U.S. military involvement in Yemen’s civil war. U.S. participation in the Saudi and United Arab Emirates (UAE)-led coalition’s military operations in Yemen has not been authorized by either a congressional declaration of war nor a specific statute. Further, by providing technical, logistical and other military support for the Saudi and UAE-led coalition in Yemen, the U.S. has facilitated numerous violations of international humanitarian law in Yemen and the creation of the largest humanitarian crisis in the world. It is imperative that the Senate reasserts Congress’ constitutional authority as the sole body that can declare war by passing S.J.Res. 54. Since March 2015, the U.S. has provided the Saudi and UAE-led coalition in Yemen with political and military support, including targeting intelligence, mid-air refueling, and other logistical support. U.S. personnel reportedly work alongside Saudi and other counterparts in the coalition’s joint command center for targeting assistance and other purposes. CENTCOM has publicly confirmed that the U.S. continues to provide mid-air refueling to the coalition, despite having no information on the objectives, flight plans, or targets of the refueled missions and no way to verify whether such missions comport with the laws of armed conflict or U.S. national security objectives. 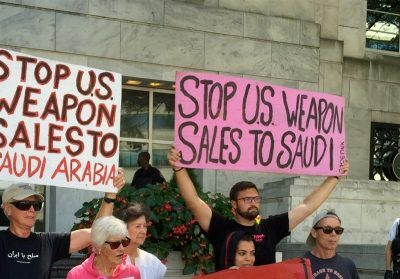 U.S. weapons sold to Saudi Arabia have been misused repeatedly in airstrikes on civilians and civilian objects that are the leading cause of civilian casualties in the conflict and destroyed Yemen’s vital infrastructure. This destruction of infrastructure has exacerbated the world’s largest hunger crisis in which 8.4 million civilians are on the brink of starvation and created the conditions necessary for the largest cholera outbreak ever documented. Yet despite the fact that the U.S. is actively aiding and abetting coalition abuses, U.S. military involvement in the disastrous conflict in Yemen has never been publicly debated by the Senate. This war of attrition has been waged using U.S. weapons, military support, and personnel without consent of Congress for far too long. Congress has a constitutional and ethical duty to ensure any and all U.S. military operations comply with domestic and international law, and U.S. participation in the civil war in Yemen raises numerous legal and moral questions that must be resolved by Congress. With S.J.Res. 54, the Senate must send a clear signal that without congressional authorization, U.S. military involvement in Yemen’s civil war violates the Constitution and the War Powers Resolution of 1973. Section 8 (c) of the War Powers Resolution of 1973 defines the introduction of armed forces as the “the assignment of members of such armed forces to command, coordinate, participate in the movement of, or accompany the regular or irregular military forces of any foreign country or government when such military forces are engaged, or there exists an imminent threat that such forces will become engaged, in hostilities.” U.S. mid-air refueling of coalition warplanes carrying out airstrikes against the Houthis clearly constitutes participation in the movement of Saudi-led military forces as well as accompanying them in active hostilities in Yemen. It is clear that U.S. logistical and targeting assistance for coalition airstrikes constitutes coordination of Saudi-led military forces engaged in hostilities against the Houthis in Yemen. The president is the Commander-in-Chief of the armed forces, but his legal authority to deploy and commit U.S. troops to foreign conflicts is extremely limited. Article I, section 8, clause 11 of the Constitution gives Congress the exclusive power to declare war. Section 2(c) of the War Powers Resolution of 1973 requires a specific statutory authorization for any military involvement in armed conflicts other than in cases of self-defense. As Houthi/Saleh forces in Yemen are not in any way associated with Al Qaeda and do not pose an imminent threat to the United States, there is simply no existing statutory authority for the U.S. involvement in this conflict. S.J.Res. 54 provides a unique opportunity for Congress to reassert its constitutional duty as the sole body that can declare war. We urge you to take the first step in reasserting Congress’ authority over declaring war by co-sponsoring the resolution and voting for it when it comes to the Senate floor.